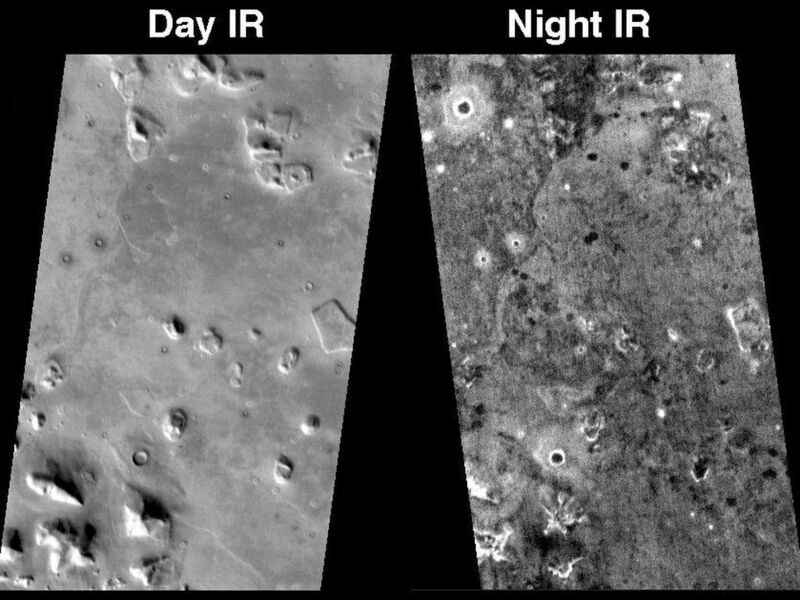 This pair of THEMIS infrared images shows the so-called "face on Mars" landform viewed during both the day and night. The nighttime THEMIS IR image was acquired on Oct. 24, 2002; the daytime image was originally released on July 24, 2002. 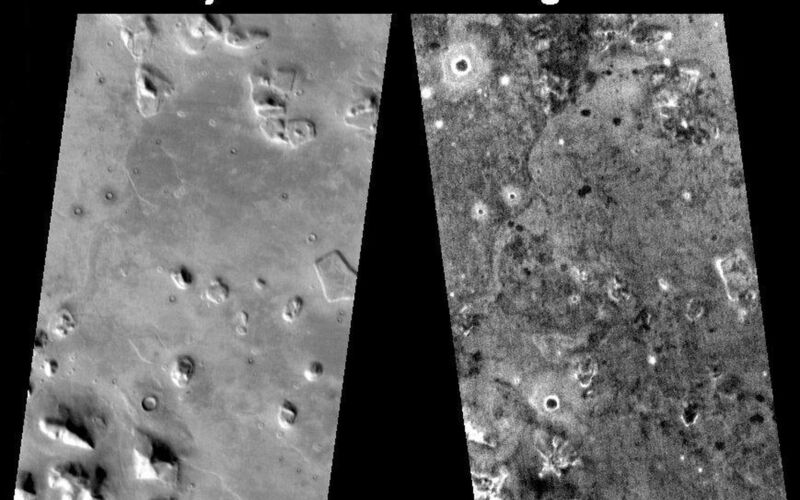 Both images are of THEMIS's 9th IR band (12.57 microns), and they have been geometrically projected for image registration. The "face on Mars" is located in the northern plains of Mars near 40° N, 10° W (350° E). This knob can be seen in the daytime image because of the temperature differences between the sunlit (warm and bright) and shadowed (cold and dark) slopes. The temperature in the daytime scene ranges from -50°C (darkest) to -15°C (brightest). At night many of the hills and knobs in this region are difficult to detect because the effects of heating and shadowing on the slopes are no longer present. The temperatures at night vary from approximately -90°C (darkest) to -75°C (warmest). The nighttime temperature differences are due primarily to differences in the abundance of rocky materials that retain their heat at night and stay warm. Fine grained dust and sand cools of more rapidly at night. The circular rims and eject of many of the craters in this region are warm at night, showing that rocks are still present on the steep walls inside the craters and in the ejecta material that was blasted out when the craters formed. 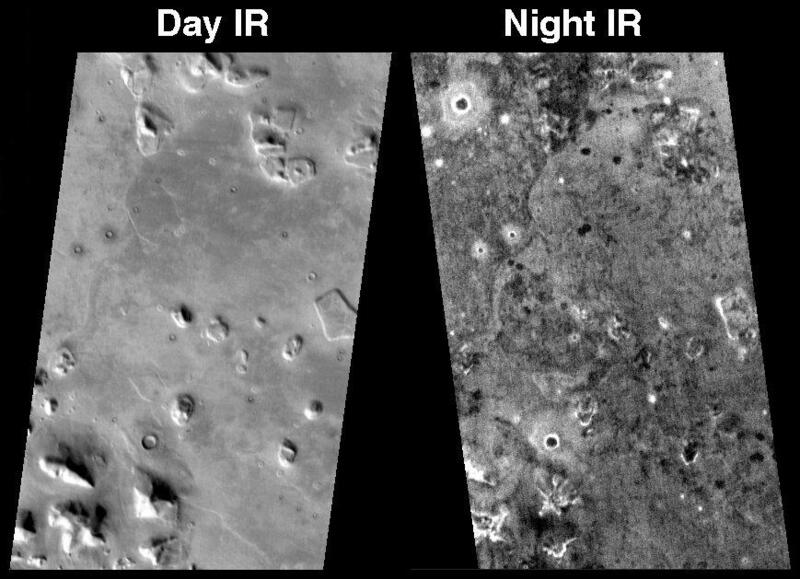 Some craters have cold (dark) material on their floors in the night IR image, indicating that fine-grained material is accumulating within the craters. Many knobs and hills, including the "face" have rocky (warm at night) material on their slopes and ridges. 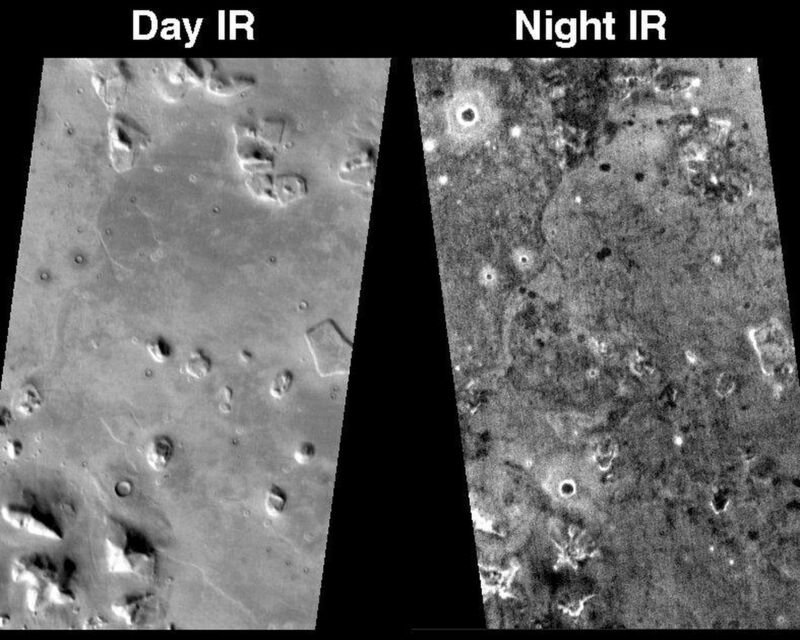 The THEMIS infrared camera provides an excellent regional view of Mars - these images cover an area 32 kilometers (~20 miles) by approximately 50 kilometers (~30 miles) at a resolution of 100 meters per picture element ("pixel"). The scenes are tilted differently because the Odyssey orbit is inclined by 3° from the true north-south direction, and the spacecraft is flying from north-to-south on the day side and from south-to-north on the night side of the planet. These images provide a broad perspective of the landscape and geology of the Cydonia region, showing numerous knobs and hills that have been eroded into a remarkable array of different shapes. In these views the Cydonia region is seen to numerous interesting knobs and mesas that are similar in many ways to the knob named the "face." The 3-km long "face" knob was first imaged by the Viking spacecraft in the 1970's and was seen by some to resemble a face carved into the rocks of Mars. Since that time the Mars Orbiter Camera on the Mars Global Surveyor spacecraft and the THEMIS visible and infrared cameras on Mars Odyssey have provided detailed views of this hill that clearly show that it is a normal geologic feature with slopes and ridges carved by eons of wind and downslope motion due to gravity. 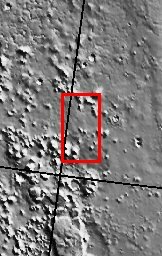 Many of the knobs in Cydonia, including the "face," have several flat ledges partway up the hill slopes. These ledges are made of more resistant layers of rock and are the last remnants of layers that once were continuous across this entire region. Erosion has completely removed these layers in most places, leaving behind only the small isolated hills and knobs seen today.